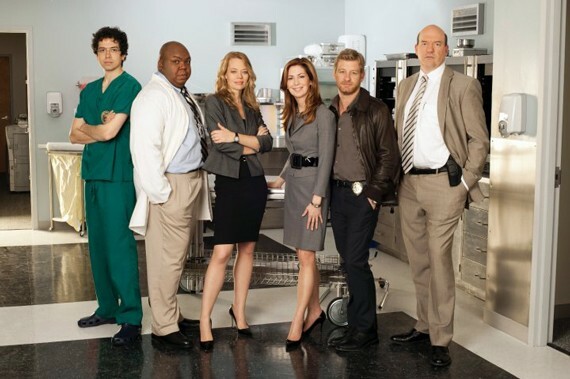 'Body of Proof' Cast - © American Broadcasting Companies, Inc. The Synopsis: Brilliant and driven neurosurgeon Dr. Megan Hunt had it all, or so she thought. As the first female Head of Neurosurgery at a prominent Philadelphia university hospital, she never appreciated how the demands of her profession were taking a toll on her personal life until her husband divorced her and she lost custody of their then seven-year-old daughter. Still reeling from this emotional trauma, Megan soon suffered a physical one, a car accident that left her with a condition called paresthesia — random attacks of numbness and cramping of her hands. Tragically, this condition failed to manifest itself until Megan’s first trip back to the operating room. She lost control of her instruments and her patient died on the table. Megan’s life as a neurosurgeon was over. Five years later Megan has found a new life as a Medical Examiner. Although she’s no longer in the business of fixing what’s wrong with living patients, she’s still instinctively drawn to finding out what killed her dead patients and uncovering who was responsible and why. As she pursues the answers, the bodies of the dead provide the clues. The body is, in effect, the proof. And with her unique blend of smarts, instinct and a warehouse of medical knowledge, she can read a body like nobody else. Megan can also ruffle feathers like nobody else. In her new career she has already developed a reputation for flouting convention and blurring the lines between the Medical Examiner’s Office and the Police Department. Dr. Kate Murphey, Megan’s boss, sympathizes to a degree. As Philadelphia’s first female Chief Medical Examiner, Kate didn’t get where she is without ruffling a few feathers herself. She hired Megan for her expertise and the results she could bring to the job. But Megan’s unconventional way of doing things presents Kate with an ongoing dilemma. Megan is brilliant but also polarizing. How much should Kate rein her in?